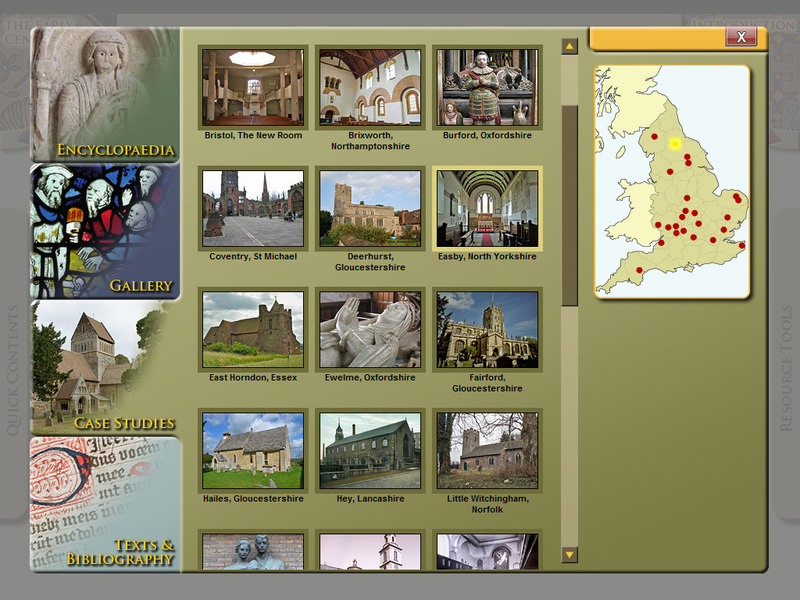 The English Parish Church through the Centuries is an extraordinarily rich DVD-ROM resource that has been produced by The Centre for the Study of Christianity and Culture at the University of York. This effectively is an encyclopaedia of information on how we end up with the church buildings we do, covering everything from the early church up to the present day. The resource contains everything from easily accessible introductions to the latest academic research on parish churches and the influence of Christianity on literature, music, art and society. Galleries of images from national and international collections. Christianity and writers such as Chaucer, Shakespeare, Donne, Milton, Dickens, Brontes, Wordsworth, TS Eliot, Tolkien, DH Lawrence. Case studies detailing individual churches from around the country. Practical sections on care, conservation, creative use, re-ordering and interpretation of church buildings and their contents. So Why Should I Be Interested? In short, because we live in an age of forgetting. Ironic isn’t it, when we are awash with more and more knowledge, that we seem to know less and less about where we have come from? This was the impetus behind the setting up of Christianity and Culture, that first year undergraduates were coming up to university with little or no frame of reference for the Christian cultural foundation of much of what they were studying. But the forgetting goes the other way too – in the church we forget how much Christian content there still is within the culture at large, and are also woefully ignorant of where we have come from. I for one have learned a good deal from the small part of the resource that I have accessed to date. And who would benefit from this resource? Well, almost anyone. Any church needing to prepare a Statement of Significance (and that’s most of us) would be well advised to have a copy. All Rural and Area Deans should have at least one copy. It would work well in schools, for architects and other building professionals – anyone really. 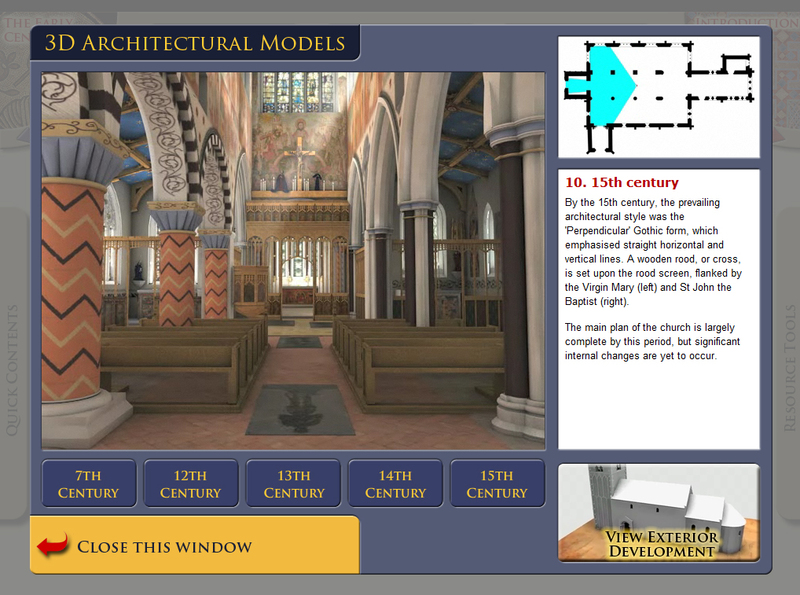 Even my 7 year-old enjoyed it, particularly the external and internal 3D virtual model of the church. So How Do I Get A Copy? The resource costs £17.50 plus postage, which in itself is an absolute bargain and available by following the link from the C&C website. Alternatively if you contact candc@york.ac.uk and quote “churchbuild” you can get a copy for £15 plus £1 postage (within the UK). Even better! 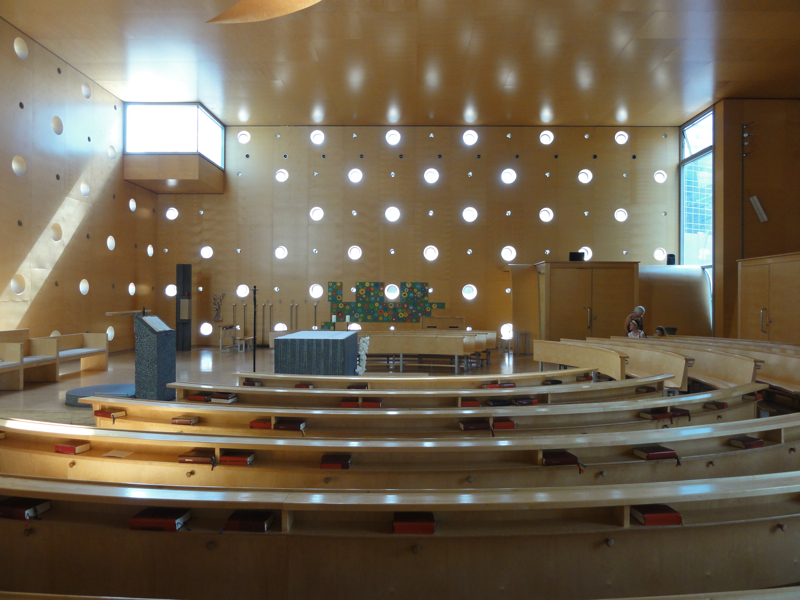 Here is an interesting example of a modern church – the Church of Christ, Hope of the World, at Donau City in Vienna. Clearly this is not everyone’s cup of tea, but as an example of modern church architecture it is both interesting and refreshing. The setting for the building is pretty brutal, commercial and soulless – high rise corporate nineties and noughties development, and then a whole load more high rise residential. 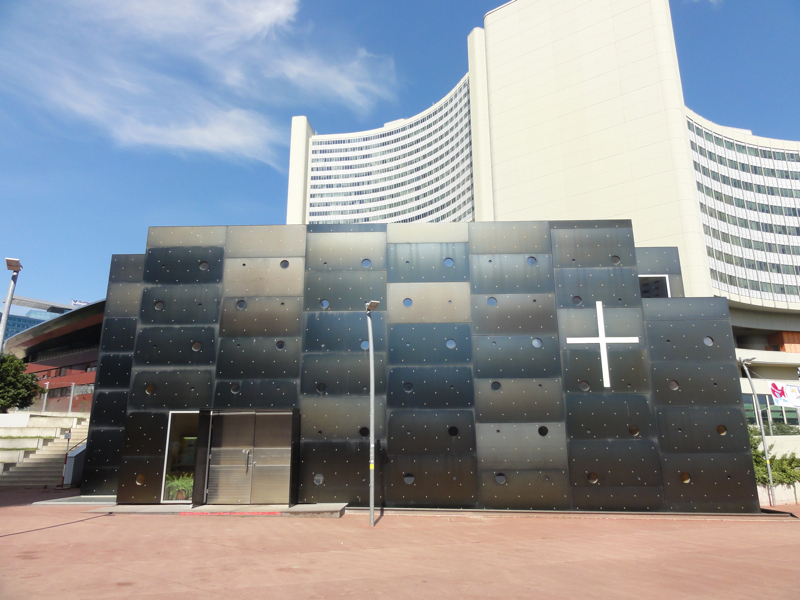 The building is immediately in front of the United Nations building – you discover the church as you step out of the underground (U1, Vienna International Centre). In this context you need a building that is robust , and this is reflected in what is a bold form and hard materials. The facade is clad in stainless steel sheet, which apparently was dipped in acid to create the darker tone. But once inside the door there is a sense of tenderness to the building – the interior is almost entirely birch clad, with key elements of fittings in granite. There are major windows in the roof and each corner, and hundreds of portholes perforating the otherwise blank expanses of wall. This creates a luminous and constantly changing feel as the sun moves around the building. It is also interesting for the sense of privacy which you feel – appropriate for worship in a busy urban setting – and openness – it is a building that is easy to get into. Of course the arrangement is, by its nature, inflexible – this is a building resolutely for a single use. That said, the pews, which are beautifully made in concentric arcs, help preserve a sense of simplicity, create a feeling of of inclusion, and form a strong contrast with the straightness of the box. The basic cuboid form is cut away at the corners for the major windows, making the ceiling a subtle Greek Cross shape. 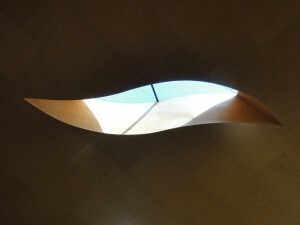 Against this geometry are played a series of curves – not only the pews and the porthole windows, but also the enclosure of the entrance lobby to the south and the storage etc to the west, a large circle inscribed on the east wall, and most particularly the rooflight – suggestive perhaps of the wind and thus symbolic of the Holy Spirit. I visited the building with two of my daughters, who promptly christened it ‘the dog box’ – a wooden box, the porthole windows like air holes, and the curvaceous skylight like the carrying handle. Such labels may not advance the official architectural debate, but can be very powerful in conferring an identity on a building – London buildings rejoice in many such labels such as the cheesegrater and the walkie talkie. More normally the nickname relates to the outward form of the building. Such naming is a powerful (and entirely legitimate) urge, presumably towards appropriation of the building into its environment. The other point of interest with regard to the Tesar church is that one immediately knows it is a church when one first sees it. The design is very deliberately not drawing on traditional architectural forms, and quite rightly so. Instead it hangs its identity, at least as far as the first impression is concerned, entirely on the white cross fixed on the southern wall. This legibility is crucial, if visitors are to find their way into the building. For more on church buildings you may be interested in the Church Building Seminar taking place on Thursday 6th October in Histon, Cambridge. 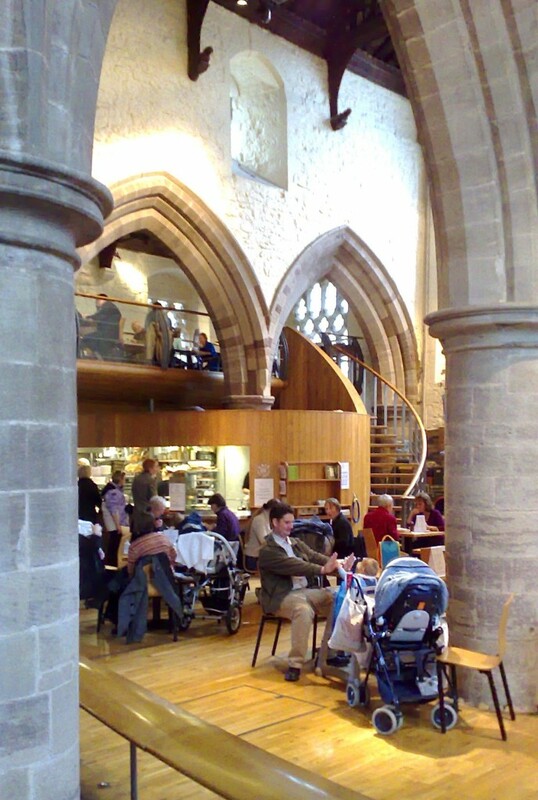 What can church buildings learn from the retail sector? There are similarities between the Church and the Retail Sector. Such a view may be a surprise to some readers, but think about it before dismissing the notion out of hand. It may not be a consumer product that we are selling but we are in the business of attracting people to take an interest in Christianity. As the Church, we have a ‘product’ (the Gospel) that we wish to promote and we want to attract people’s interest in the life of the Church, in the hope that these newcomers may make a long term commitment to Christ. There are considerable similarities with what shops and businesses are seeking to achieve in promoting their goods and services to the general public. We have much to learn from the retail sector about how to promote what we are offering and how to attract and keep people’s interest. The church building is the ‘business premises’ for the Church community. In the various contexts of Church life (parish, diocesan and national), our buildings and property serve as our ‘shop windows’ and they have an enormous effect on how what we are offering is perceived. Similar to shops, our premises can attract, serve and retain people or, conversely put them off from coming near, let alone inside. Cold, dirty, closed, uncomfortable and unkempt church buildings are a significant barrier to all three Diocesan Priorities. Rather than serve the Mission of the Church, church buildings can hinder it. Sometimes, it is the building which is not ‘fit for purpose’; more often, it is the way that we manage the building which results in it being a hindrance and barrier. If a church building acts as a significant barrier to any of our three priorities for action, then it may well be necessary to either make changes to the building and its management or relocate operations to more suitable premises. Many non-Church people have anxieties about and fear of church buildings, what goes on inside them and the people associated with them. For some people churches are virtually alien territory and are viewed with apprehension. Church members need to have an awareness of a retail principle ‘the Moment of Truth’. This is the moment when all the advertising and promotional claims are measured against what the retailer actually delivers. The person doing the measuring is the customer and if the gap is too big between what is claimed and what is delivered, the customer may well be lost forever. The Moment of Truth applies to the Church as well. In the case of the Church, the Moment of Truth is when all the claims made in the name of Jesus Christ are measured against what the Church actually delivers. If the gap is too big then, similarly, this too can result in the person never coming back. Both Church members and church buildings have a big part to play in the Moment of Truth. So how far should the church go in learning from the retail sector? Please leave a comment. [Editor’s Note: Andrew Mottram is an authority on the adaptation of church buildings. He was ordained an Anglican priest in 1979 and had nearly 30 years experience of parish life, including many years of making church buildings work for people. When he was Priest in Charge of All Saints Hereford, the church building was re-ordered and opened up to the community in 1997. 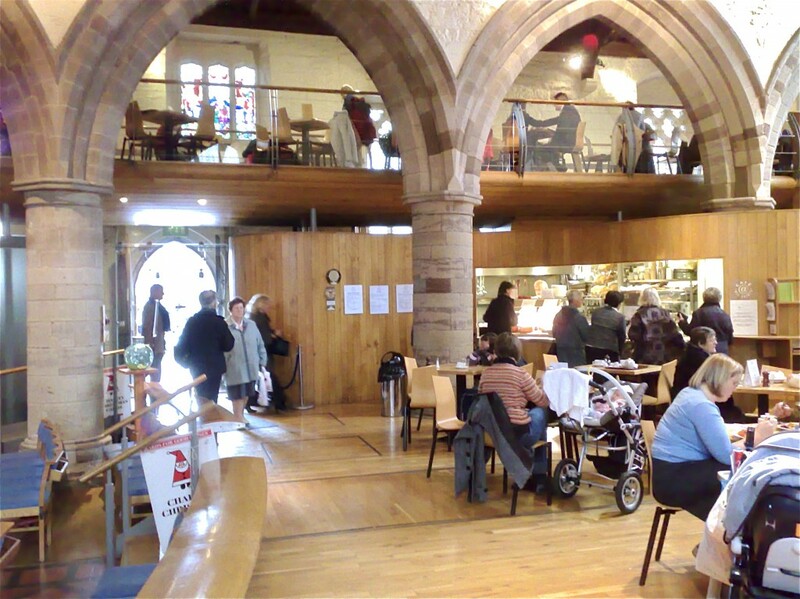 Café @ All Saints has proved to be a successful business venture. The ‘new’ All Saints generated numerous enquiries and requests for help which led Andrew to set up Ecclesiastical Property Solutions Ltd (EPS). From 2004 to 2009 EPS helped over 500 individual Church communities with their buildings and provided training and support to clergy and laity in 23 Dioceses. EPS also worked at a national level with English Heritage, The Church Buildings Council, The Churches Conservation Trust and The National Churches Trust. What Jools Holland Can Teach the Church? 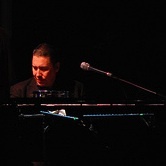 I enjoy Jools Holland for his ability with Blues piano, and to a lesser extent his Big Band showiness. What I like even more is his signature TV show, Later… with Jools Holland, where each week he assembles an impressive breadth of different artists, drawing in some big names, veteran performers and showcasing some new talent, and manages to craft a sense of common purpose out of what often seems an odd assortment. The relevance of this is that Music is often tribal, with most of us fixing on a relatively narrow range of genres, with which we find ourselves comfortable. With the Later show, there is an anarchic sense of juxtaposition, out of which comes an odd sense of coherence. And here is the parallel with the church. In all honesty, we in the church also tend to gravitate to a style of worship and a group of people with whom we are comfortable. Given what St Paul wrote about the essential variety within the church this is not ideal, though at a social level this is of course natural enough. The danger is that we so easily become ‘mono-cultural’. Which makes those churches which are able to bring together diversity in community all the more impressive. In the late 1980s I lived and worked in Islamabad, the capital of Pakistan. I was there to build (bricks and mortar) St Thomas’ Church. Buildings aside, as an expression of the body of Christ St Thomas’ was hugely impressive in holding together the full breadth of that society, from the illiterate street sweepers, through the educated Pakistanis – who might be cooks or drivers or engineers or military officers – to the foreign mission partners, aid workers and diplomats. 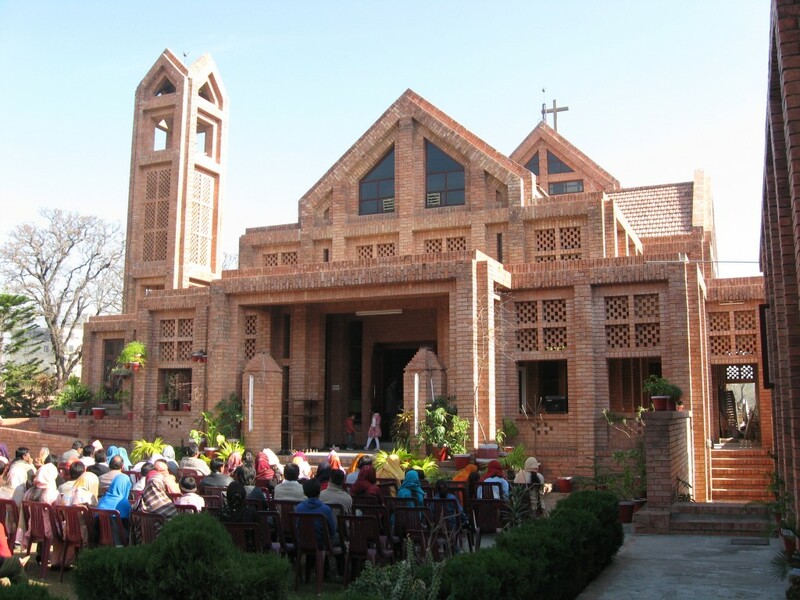 The church had services in 3 languages – Panjabi, Urdu and English – each meeting at different times; but it had one PCC and events (including a church weekend away) were orgainsed that combined all three congregations. Clearly this was not all straightforward, but no other institution in Pakistani life could get close to holding together that social breadth. So what sort of a building could serve such a diverse range of people? In shape the main worship space is cruciform; but the form is certainly not English neo-Gothic, which was the first thought of many in the church, on the basis that most of the churches there were built by the British. The church is of its place – using skills and a design language that draws on Moghul architecture of patterned brickwork – but also challenges its place. I think Jools has much to teach us – in his ability to take a diverse range of performers and articulate a compelling narrative, in his case in live performance, even getting chalk and cheese to play together.